The ceremony celebrating our street renaming was a highlight of the October 10 Global Day of Clay. Please visit soon and proudly post a selfie at our new street sign. Join us in spreading the good news — that Baltimore Clayworks is indeed on the map and here to stay. For those of you who missed the festivities, please visit the recently-refreshed BaltimoreClayworks.org website. Along with photos and recaps of the wonderful celebrations, you will see citations and letters from civic leaders on this landmark occasion, as well as letters from children who participated. It’s a joyous record of the continuing impact of our organization, our community, and our many friends. Inherent in understanding the accomplishment of Clayworks’ renewal is that we build on a strong 38-year legacy: bringing together and supporting the best in ceramics — people, arts, and education — to expand opportunities for all to experience the joy of clay. Special thanks to Councilman “Yitzy” Schliefer and his colleagues on the Baltimore City Council for the Clayworks Way renaming. Their strong support throughout the 2017 campaign continues visibly. 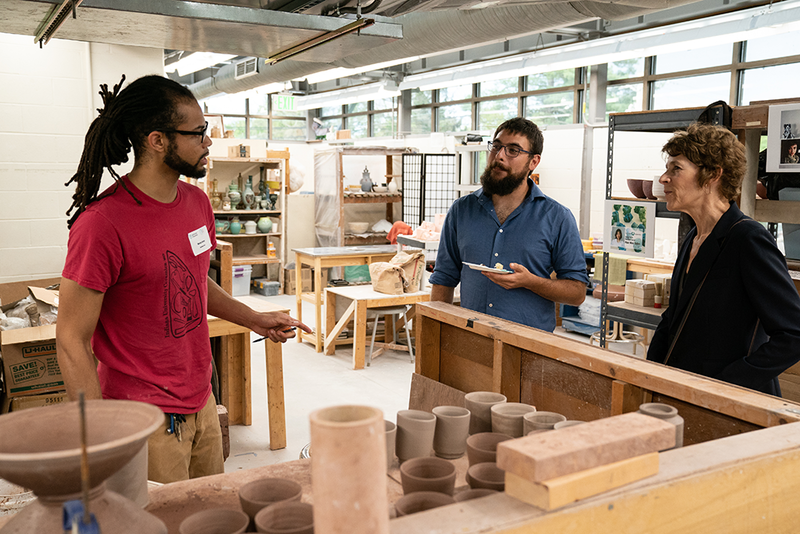 Baltimore Clayworks was recently awarded an important grant from the Baltimore Children and Youth Fund, to initiate an innovative ceramics and technology internship program for teenage and young adult Baltimoreans. We look forward to continuing this productive and supportive relationship with the leadership of our City. Likewise, many Maryland state legislators and leaders continue to bring meaningful support for our mission. They were instrumental in obtaining funding for Baltimore Clayworks from the Maryland State Arts Council at a critical time in our reopening, making possible the restart of our exhibitions and other important arts programs. Once again we would also like to salute the grantors, foundations, and major donors who expressed confidence in the renewed organization with generous funding over the past several months, and pledges for the future. Your endorsement is an inspiration for many individual donors whose contributions to our non-profit are also invaluable. As we enter the final quarter of 2018, Baltimore Clayworks will once again seek contributions and donations from many of you. For those whose generosity enables them to contribute $500 or more, we are pleased to offer Maryland Community Investment Tax Credits, and thank the State for this program once again. Please contact Mary Jo Kirschman via info@baltimoreclayworks.org for the appropriate forms. And be on the lookout for our fundraising messages to come! How will Baltimore Clayworks put your contributions to work? We announced at the ceremony that Cyndi Wish will join Baltimore Clayworks as Executive Director, effective this week. Cyndi’s background in education and nonprofit arts administration includes work in Massachusetts, Chicago, San Francisco, and most recently at the Jamestown Fine Arts Association in North Dakota. We are excited to have recruited Cyndi and look forward to her leadership as we move forward. Nicole Fall, who stepped in to direct staff operations in the interim, will be staying on to facilitate the programs made possible by the Baltimore City grant. We are pleased that this fine artist and arts community leader will continue to represent Baltimore Clayworks. Nicole’s good work in attracting this grant, as well as the Bloomberg Philanthropies’ organizational mentorship, will pay dividends for our organization and enhance our impact for years to come. Behind the scenes, your Board of Trustees has worked diligently to restore Baltimore Clayworks to stable financial footing. Over $1 million in obligations inherited in 2017 have been paid and resolved. Most importantly, our restarted education and exhibition programs and successful development initiatives achieved visible results. This enabled us to project a model for financial stability and sustainability. With the help of our legal and financial counselors, Baltimore Clayworks has entered new agreements with Columbia Bank for short-term and long-term financing. Ownership of our buildings and facilities is no longer endangered. No words can express the depth of our eternal thanks to the artists, staff members, volunteers, vendors, participants and partners who made it possible to get the ball rolling once the Agreement was signed and keys turned over to us one year ago. You are Baltimore Clayworks, and everything we accomplish will be built on the momentum you began. To the students who enrolled in classes and workshops, the parents who sent kids to summer camps, the collectors and visitors who patronized our Gallery exhibitions and shops, the artists who applied and those who were selected as Resident Artists … your confidence and excitement will never be forgotten. We look forward to sharing many happy times and beautiful arts together in the years ahead. Expansion of our Youth and Family Programs to include after-school sessions and regular field-trips that introduce Baltimore Clayworks to young audiences and provide valuable education and inspiration. Increases of our Community Arts Programs in Baltimore City and Baltimore County. Interaction and involvement programs for Resident Artists, Associate Artists, students and donors to connect, communicate and grow. Improved Baltimoreclayworks.org website, social media pages, email newsletters and public relations visibility — part of a strategic marketing and communication program. I hope you are inspired to continue to participate at Clayworks. Take a class or workshop … make a donation … browse and shop in our Gallery and in neighboring Mt. Washington Village … tell your family and friends about our (always free) Exhibitions … share photos on social media … volunteer for a Committee or to help with an Event. The work of Baltimore Clayworks is and always will be a collaborative, team effort to share the joy of clay in meaningful ways. Join in! And thank you. Sue Patz, Board President, Baltimore Clayworks Inc.